Last week’s sky watching event focussed on the planet Jupiter and its moons. As Jupiter has more than 60 named moons we concentrated on those that can be seen with a small telescope; the four Galilean moons. The weather forecast was not promising, the event was due to start with a talk at 7.30pm but by 6pm the sky was covered by a blanket of clouds. However, as we were about to begin the clouds suddenly parted just enough to reveal Jupiter peeking through the haze. We decided to abandon the talk temporarily and headed outside to observe at the telescope while we had the chance. We were very lucky to be able to see Jupiter along with both of its dark equatorial bands and all four Galilean moons. We also had binoculars on hand for when the waxing gibbous Moon occasionally peered out from behind the clouds. 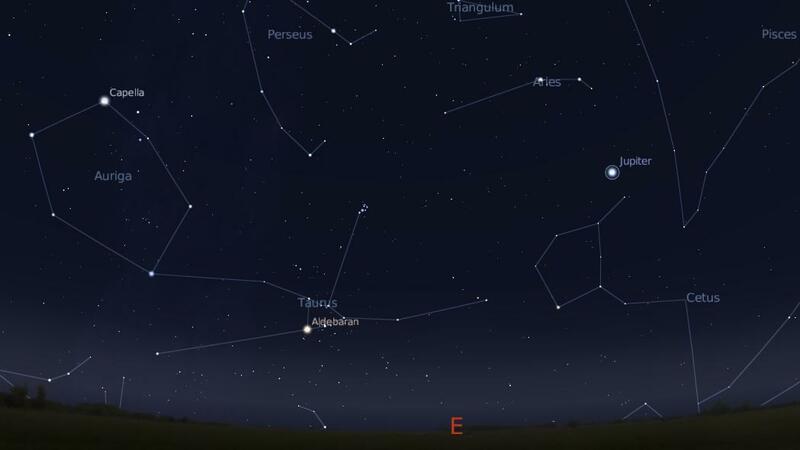 Unfortunately the clouds prevented us from observing the constellation of Taurus which is really quite fantastic at this time of year. The Pleiades open star cluster looks particularly beautiful through a pair of binoculars. As the clouds rolled back over Jupiter at around 8pm we made our way inside to warm up and continue with the evening’s talk. We were exhilarated to have managed some observing on such a cloudy evening. We rounded off the night’s event by discussing what we know about Jupiter and what it is hoped we will find out from the recently launched Juno probe. For information about future sky watching events here at TLES take a look at our Forthcoming Events page. This entry was posted in Curriculum, Events and tagged Galilean moons, Jupiter. Bookmark the permalink.